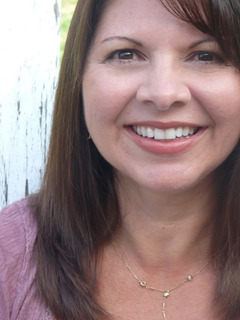 Julie Carobini, author of Fade to Blue, is a prolific writer with five novels and over one hundred magazine articles to her credit. When she's not writing, you'll probably find her strolling the beach, hand-in-hand with her real life hero while their dog ploughs ahead. She’s a happy mom to three kiddos in three very different stages: college, high school, and middle school. Julie has been writing magazine articles for twenty years and books for five, but sometimes dreams of chucking it all to crew for one of the yachts that takes tourists to the nearby Channel Islands. Although personally, I'd expect to find her wandering through an enchanted castle, sifting through antique chests, dreaming up her next story. Fade to Blue is centered around the magnificent Hearst Castle, built by William Hearst, a wealthy newspaper man, in the late 1800's. Impacted by a childhood of travels, Mr. Hearst determined to create the home of his dreams, regardless the expense. When builders finished, the castle contained 165 rooms and 127 acres of gardens, terraces, pools and walkways. Could Julie have chosen a more exquisite setting for her novel? backdrop," Julie says. "So much intrigue and mystery about that real castle on the hill overlooking the sea. Of course, novels are more than their location, so after writing the first two stand-alone books, Sweet Waters & A Shore Thing, I had an idea. Why not figure out what happens next for big-hearted Suz Mitchell from A Shore Thing? So ... 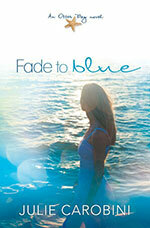 Fade to Blue is Suz's story." As a dreamer, Suz is the perfect character to renovate the castle because he lives in a world of endless possibilities. Of all her characters, Julie Carobini relates most to Suz. "I relate to Suz because I'm a dreamer too," Carobini says. "Even when things are at their darkest, and even after a bit of thrashing around, I still believe things will get better. So how does Julie transport herself into story world? Besides lingering through the lush gardens of Hearst Castle, notebook in hand, of course. "I write in my home office, but when I can," Carobini says. "I like to take my laptop up to the Rincon Beach (made famous in the Beach Boys song) and write from there. The last time I did that, though, I left the radio running in my car and killed the battery. Lol ... still it was lovely." She's been writing for as long as her kids can remember. Literally. "I've been writing since my oldest child was a newborn, and he'll be twenty this year," Suz says. "I wrote an essay called Baby, Cordless Phone, and Me in longhand on a legal pad and sold it to Expecting, an offshoot of Parents Magazine. Because their readership--pregnant women--changed so often, they printed that story four years in a row :)"
In many ways, she's living her dream. She's always wanted to be a writer. "My dad wrote magazine articles on the side," Carobini says. "Including interviews with actors such as Fred Astaire and Fred MacMurray. Always loved that! I wrote articles for years, but always yearned to create fiction. I wrote two novels that did not sell, but as they say, third time’s a charm, and my debut novel, Chocolate Beach, released in 2007 (re-released with recipes in 2011 as an eBook). By that time, I had a renewed faith in God as well as a redefined focus on the kinds of stories he was leading me to write. " Upon reading Fade to Blue, Julie hopes her readers appreciate their Creator and experience His love and grace. "I hope readers get lost in the story and the beautiful setting," Carobini says. "That they revel in God’s creation as much as I did while writing it. I also hope they experience the Good Shepherd’s gentle leading (Psalm 23), and fall in the love with the concepts of forgiveness, sacrifice, and grace—as much as they do the breathtaking locale." Visit Julie's website and blog to find out more about her and her writing and hop on over to Amazon to order your copy of Fade to Blue! And don't forget, there's numerous ways to be entered into the book give-away drawing. Leave a comment, fb share this post, tweet this post or become a subscriber, then shoot us an email to let us know. And don't forget to join our book club! Starting...now! How nice to see you here today and to meet a fellow dreamer. Your book sounds both fascinating and worthwhile. Hi Julie! Good to have you. I read A Shore Thing and found it refreshing. Well done! I find it quite amusing that you killed your car battery while writing on the beach. Lol! It's a great story. So who rescued you from the beach? I guess there are worse places to be stranded that at a California beach with everything you need to write! Julie, such a fun interview! Your novel sounds wonderful! Great interview, Julie! Blogger was a booger the last few days and wouldn't let me comment. You are just five hours from me, maybe I can pop in to see the castle with ya one of these days, eh? ;) So sorry I missed your signing that day. I hope I get another chance to meet up with you.